It must be left an open question whether it will prove a practical means of reconnoitering the enemy. Herein General von Bern­hardi indicated a lack of imagination which is apparent at some other places in his written works. 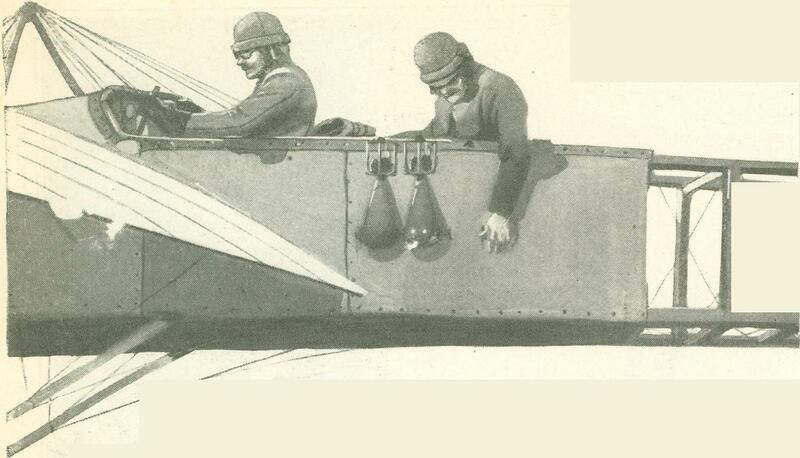 The practical utility of the aeroplane was not an open question even then. The at­titude of the German War Office showed that the heads of the Kaiser's forces already considered it fully established. Even at that time they were building a large fleet of flying-machines, and every great power in Europe was sedulously at work in the same direction. 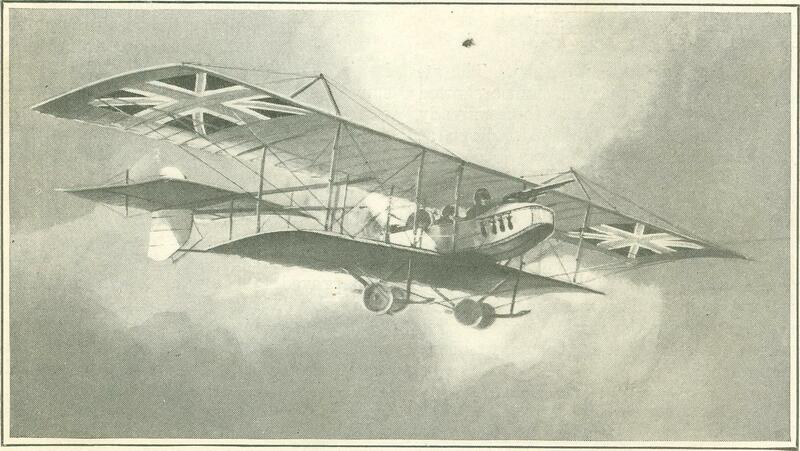 The work performed by the Royal Flying Corps has continued to prove of the utmost value to the success of operations. Almost every day new methods of employing them, both strategically and tactically, are discovered and put into practice. The development of their use and em­ployment has been quite extraordinary. I feel that no effort should be spared to increase their number, and perfect their equipment and efficiency. Evidently it is no longer an "open question" in England. Of course, the government does not announce just what measures it is taking to carry out General French's recommendation, but there is no doubt that it is doing all that can be done to increase its force of aeroplanes. It is safe to as­sume that all the English makers of air­craft are hard at work on army orders, and American newspapers have contained fre­quent references to British purchases in the United States. The key to the present demand for aero­planes is to be found in the two words of the official report - "strategically and tactically." The flying-machine has more than proved itself as a "practical means of reconnoitering the enemy." It has pretty nearly eliminated "classic" strategy and has seriously hobbled the tacticians on the battle-fronts. It may almost be said that two bicycle-repairers of Dayton, Ohio, have made waste paper of the text-books of Napoleon and Moltke. For the essence of strategy is conceal ment, and the vital principle of battle tac­tics is surprise. The aeroplane has made both next to impossible. You cannot con­ceal the movements of large bodies of troops over a great area when the upper air is dotted with scores of military avia­tors equipped with powerful field - glasses and able to report by wireless telegraph. Similarly, it is all but futile to attempt a surprise attack in a small battle area when the airmen are watching your every move. In the present article there is not space for an extended demonstration of these propositions as illustrated by the events of the European war; but it is clear beyond argument that speed in transportation has been substituted for concealment. The rule "to get there first with the most men” still holds, but the aeroplane has made it a question for railroad superintendents and motor-lorry chauffeurs, instead of profes­sors of strategy. There was no concealment about Ger­many's great concentration at Cracow for the drive at the Russians along the Du­najec, in May. It was the only plan open, and every one - even spectators on this side of the water - could predict it with prac­tical certainty. But Germany was able to concentrate more troops, and more efficient troops, in quicker time than Russia - and the Slav host was driven back. Again, the Battle of the Marne could not have been so sure and complete a triumph for the Allies but for the efficient work of the air-scouts. Every mile of that stub­born and bloody retreat from Mons, French and Joffre knew what the German armies were doing. They could figure just about when the British front and flanks could be cleared from the overwhelming num­bers that threatened to surround and over­whelm that wonderful little army of "mercenaries." They knew when they crossed the Aisne that the time to strike would come at or about the line of the Marne. Von Kluck and Von Billow rushed on in fierce pursuit, endeavoring to drive the heads of their columns in between the British right and the left of the nearest French army, under General d'Esperey; but the Allied commanders knew that their power to fight must be diminishing steadily. Airmen had marked the trails of the am­munition trains and supply convoys far in the rear of the invaders. The Germans were pushing forward with empty haver­sacks and empty guns, and when the de­fenders turned and delivered a crushing counter stroke it was with the confident calculation, on the part of Joffre, that the heads of the invading armies would be shattered. There was no guesswork about it. Joffre knew positively that Von Kluck, lacking adequate support, and with his right wing "in the air," was in a dangerous position, and that under a strong and concerted at­tack the whole German line must inevitably be rolled back like a gate. Kipling once wrote of "the blindfold game of war"; but that was before the, Wright brothers had wrought their miracle. War is no longer a blindfold game. Half a dozen men in swift aeroplanes can detect and upset the best-laid plans of a war college. But the question naturally arises, if four or five men can do all-this, why is there an insistent demand for hundreds upon hundreds of air-scouts? The answer is plain. A few aeroplanes are enough to be the eyes of a general, but he needs hundreds to blind the eyes of the opposing commander. Before the aeroplane came, a campaign was like a card game in which each man sought, by inference and deduction, and by skillful leads, to ascertain the strength of his adversary's hand. Since the develop­ment of aerial scouting, war has become more like the gambling game known as "stud poker." In this the first card is dealt face down, and the remaining four face up, exposed to the view of both play­ers. Now, it is plain that if one of the contestants were blindfolded, matters would be very easy for his opponent. The ad­vantage of the player having the use of his eyes, as against an antagonist deprived of that faculty would be immeasurably great­er than in the game where all the cards are concealed. For this reason the Allies are making every effort to drive the German airmen out of the skies. Every day there are re­ports of real "battles in the clouds," of duels to the death thousands of feet above the plains of Flanders or the peaks of the Vosges, and occasionally of Zeppelins sur­rounded and brought down like a great bull buffalo harried to death by a pack of nim­ble wolves. This is the logical development of aerial warfare. Each side is bending every ef­fort to watch the movements of the enemy, and at the same time to blind him to its own operations. If either should finally prove completely successful - if either should succeed in keeping the enemy's scouts out of the air for any length of time - it would be in a position to carry on op­erations that might speedily change the whole complexion of the war. The struggle for the mastery of the air has grown more and more intense during these past months, for the dullest soldier can see that there is no longer any "open question" about the value of the aero­plane. Machines have been developed for all sorts of fighting and scouting work - not by a set plan, but by the necessities of the situation. In a surprisingly short time there has sprung up a whole new depart­ment of war, almost comparable to the army or the navy. It has its own officers, its own military divisions and units, its own tactics, its own strategy, its own bases. And in this growth it has followed with singular fidelity the general plan of a mod­ern navy. 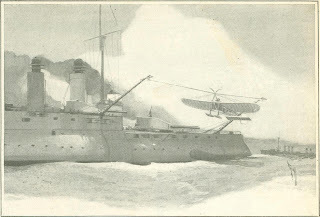 The fighting forces of the air have their scout-cruisers, their fast battle-cruisers, and their dreadnoughts, like a well-balanced fleet of the sea; and it is predicted that we shall soon hear of flying torpedo-boats, which may prove a worse menace to shipping than the submarine. It is, of course, impossible to describe these various craft in scientific detail. They have been developed to a great extent since the beginning of the present war, and no one on this side of the Atlantic can know all the secrets of their construction and use; but some of the types can be clearly identified by American airmen. In the first place, there are the fleet scout-cruisers of the air. These are small machines, usually of the biplane-tractor type. They carry only the pilot and an observer, and their plane area is so small that they can remain in the air only when traveling at high speed. Experts here state that the minimum gait of the new models is in the neighborhood of seventy miles an hour, and the maximum perhaps double that. These fliers are used solely for observation work. Therefore they are lightly armed, carry­ing a small machine gun at the most. Be­ing too swift to have much fear of artillery, they need to protect themselves only from attack by other aircraft. They take to their, heels and pump rifle-bullets at pursuing aviators, bringing back information of the doings of the enemy's flying forces, and carrying 'to general headquarters reports on the movements of troops and trains. The second line corresponding to the battle-cruisers, are large, heavy biplanes equipped for rather rough work in the air. The lifting power of the latest machines is only a matter of guesswork, but it is known that their stability in full flight has been perfected to such a point that they can absorb the recoil of a six-pound quick-firing gun without danger of upsetting. It was reported, some weeks ago, that a German plane of this type was brought down in France. It carried two men, a small gun, seven or eight bombs, and more than thirty hand-grenades. You can readily see that there were considerable potentialities for trouble in this one machine. The maximum speed of the cruising biplanes is ap­proximately the minimum speed of the lighter scouts; but even so, they are dan­gerous to the swift spies be­cause of their long range hitting .power. They shoot explosive shells, and it is not necessary to strike one of the light machines to bring it down. A shell that bursts anywhere within a goodly number of feet will create an air disturbance sufficient to upset the delicate balance of the enemy's swift flier, and to send it toppling, end over end, to the earth below. Despite the fair-sized arsenal car­ried by that German machine, craft of this type are of little use in a military sense against land forces. While they might carry, for in­stance, half a ton of bombs, or even more, each bomb must weigh well under two hundred pounds. If the aeroplane, traveling at high speed, is suddenly relieved of a great weight, it is likely to leap into the air and turn turtle, especially since the bombs are released-from the side, and not in the center line of the car. But these cruisers are rapidly be­coming the terror of dirigibles, the dreadnoughts of the air. Even the Zeppelins, with their rigid metal bodies divided into twenty-five or thirty compartments, have to fear these battle-cruisers when they come in numbers. About the middle of May it was reported that a swarm of twenty-seven Allied aeroplanes of the battle-cruiser type attacked a Zeppelin in Flanders, and succeeded in blowing so many holes in its aluminum envelope that the "big sausage" finally came down to earth a wreck. This was a newspaper story - not, alas, a guarantee of accuracy - but early in June an official Admiralty report described the total destruc­tion of a Zeppelin, near Ghent, by a young English aviator who had entered the naval air service only a month before. The flying man, who must have been a skillful op­erator mounted on a swift machine, succeeded in rising above the German mon­ster and dropping bombs that first par­tially disabled it and then caused a tremendous explosion of its gas-tanks. With its crew of twenty-eight men, the big dirigible crashed to the earth a mile below, where, by a tragic piece of ill luck, its shattered frame struck a Belgian convent and killed several of the inmates. The victorious aero­plane was upset by the force of the explosion, but the operator righted it, volplaned to the ground within the enemy's lines, restarted his engine and flew off in safety. It was a curious coincidence that on the same day Count Zeppelin was reported as acknowledging a message of congratulation from the German Aviation League, and incidentally, remarking that his invention "had brilliantly proved its worth." The modest parent of the Zeppelin seems to have a much higher opinion of is progeny than most of the impar­tial observers. But it is when aeroplane and aeroplane meet far above the battle-field that the old romance of war is re­born in its newest and most thrilling guise. The soldiers of the air have developed their own tactics of bat­tle, which are strangely reminiscent of the stories that came down to us from the ancient and royal sport of hawking. Each aviator tries to get above the other, and to attack when his opponent is in a defenseless posi­tion. One of the neatest bits of aerial strategy is to maneuver so that the fire of your machine gun enfilades the enemy's propellers. A stream of bullets poured along that line is practically certain to wreck one or both of the great wooden fans and bring him to the ground. The leaden clouds hung high. Below the air was still and clear. A speck suddenly appeared in the focus of the glass, in the direction of Brussels. The speck became a gnat, then a fly, then a wasp. It was a new Aviatik coming at terrific speed. Below we could see people rushing for shelter. Six officers, with their pilots, ran to the hangars, ready to mount. A whirring sound made them pause and then shrug their shoulders. Garros, the lone bird-man, was ahead of them, as usual. The Aviatik came nearer. It contained two men and a machine gun. Garros was flying low, gliding over the level land in the shadows, and then suddenly mounting in the rear of the enemy. At last he was seen, and the Aviatik made straight at him, dropping bombs to lighten the craft. The bombs exploded with smothered booms in the mud of the marsh. Then came the rattle of the machine gun. Garros mounted higher and began to circle. As the Aviatik could not pivot quickly enough to keep within range of him, it also began to circle. So round and round they went, Garros constantly drawing the circle closer. We could see the white patches in his wings where the bullets had gone through, and a stream of petrol flowed in his wake. Then, at a height of about fifteen hun­dred feet, Garros let loose with his mitrailleuse. It was all over. First the German gunner col­lapsed, then his pilot. The Aviatik burst into flames and plunged downward. Men ap­peared from everywhere and cheered. Garros circled gently to the ground and alighted twenty yards from the burning mass. As he approached it, he uncovered and saluted. He stood there silent, perhaps sorrowful. As we rushed forward across the marsh yelling like dervishes, he walked slowly away. I saw tears running down his cheeks. Not only on land, but at sea as well, the aeroplane, the "flying boat," is attaining an increasing military importance. When this great war is over, we are likely to learn that the vigilant aeroplanes of France and England explain the mystery of the constant transport of men and munitions across the Channel with so little danger from the lurking German submarines. For the aeroplane is the deadliest enemy of the "under-sea boat." It is the kingfisher of the new war. This is easy to understand. A man flying above the ocean can see into the water to an extraordinary depth. He can make out a submarine or a submerged mine almost as readily as if it were on the surface; and the sub­marine cannot see him, for its peri­scope is not built that way. He can follow it for miles, and if it comes to the surface he can demolish it with a bomb or a six-pound gun long before he is discovered. Or with his wire­less telegraph he can notify the des­troyers and scout-cruisers and guide them to their prey. The value of the flying craft as scouts in naval campaigns is immeas­urable. More than twice as fast as anything that floats, and with a range of vision limited only by the strength of telescopes, one stout aeroplane can gather more information, and trans­mit it more swiftly, than a dozen scout-cruisers. It may be recalled that in the naval maneuvers of the early summer the battle-fleet defending our Atlantic coast was outgeneraled. The attack­ing fleet completely eluded it, and entered Chesapeake Bay while Ad­miral Fletcher and his dreadnoughts were groping around for it off Cape Cod. The official report stated that Fletcher's light scouts were over­hauled and sunk by the enemy's battle-cruisers. He had no flying boats, and was thus left sadly in the dark as to the nature of his antag­onist's movements. Our navy has no battle-cruisers; but if each of these scout-cruisers had carried a powerful aeroplane, Admiral Fletcher would surely have obtained the information he so much needed. And a battle-cruiser costs about ten million dollars - a flying boat about ten thousand dollars. American aeroplanes are appre­ciated by the European naval and military experts, and since the great war began the belligerent govern­ments have kept our factories working at full capacity. It must be remem­bered that while no neutral nation may furnish ships to one of the con­tending navies, the sale of air-craft is no breach of neutrality. It is said that single orders have been given here for as many as one thousand machines, and that the total amount of the contracts placed with American builders in less than a year has reached sixteen million dollars. It is understood that the standard specifications have called for land-going machines with engines of one hundred and thirty horse-power, and seaplanes of one hundred and sixty horse-power. There have also been orders for giant air-cruisers equipped with two engines, each of no less than two hundred and sixty horse-power. It is risky to attempt to prophesy what the airmen may do in the future. War has hastened the development of the science and art of flying, but the aeroplane may prove an ungrateful child. These great mechanical birds which now carry hundreds of pounds of fighting material without the aid of rail­road or waterway or seaport or dock will someday transport hundreds of tons of freight and passengers. The Damascus blade was, in a sense, the father of the locomotive and the printing-press. So the aeroplane, brought swiftly forward under the pressure of war, may someday be a potent factor for peace. For the aeroplane is free and the air-lanes are free. From the earliest times man has fought with man on roadways, for rivers, for seaports and the narrows of the seas. The great issue between Germany and England is "the control of the seas." Belgium, the Germans say, is to be annexed because it is "a natural outlet for Germany." Austria fought Italy rather than give up Trieste, her window on the Adriatic; and so on. Originally published in Munsey’s Magazine in August of 1915.